Jazz may be king, but heiress Mae Malveaux rules society with an angel’s smile and a heart of stone. She made up her mind long ago that nobody would decide her fate. Marriage, money, freedom… Mae wants complete control. To have the pleasure she craves, control is paramount, especially control of the men Mae attracts like moths to a flame. Valiant Jackson is accustomed to getting what he wants—and he’s wanted Miss Malveaux for years. The door finally opens for him when Mae is slighted by her former lover Frank Washington, and she strikes a bargain: seduce her virginal young cousin, Cecily, who is now engaged to Frank, a man who values Cecily’s innocence above all else. If Val is successful, his reward will be Mae. Unbeknownst to Mae, Val seeks another, even more valuable prize. Elizabeth Townsend is fiercely loyal to her church and her civil rights attorney husband. She is certain that there is something redeemable in Mr. Jackson. Little does she know her most unforgivable mistake will be Val’s greatest triumph. But Mae and Val are unprepared for what can happen between a woman and man when the thrill of the chase spirals wildly out of control. Scott deftly tackles themes of love, faith, lost innocence, betrayal, and redemption in this stunningly original novel. 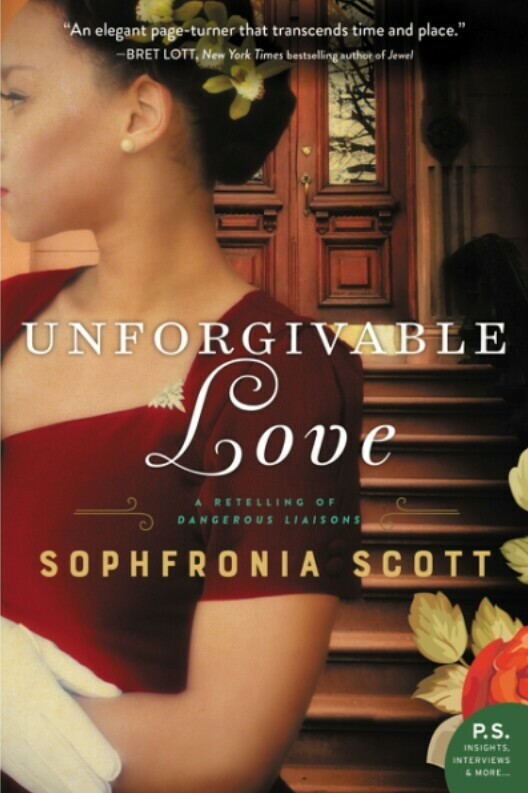 UNFORGIVABLE LOVE introduces readers to both the café society and upper crust Harlem and takes readers from the grand town homes on Lenox Avenue to the lush woods of Anselm, North Carolina, in a whirlwind of passion. Mae loved herself with a ferocity that came of feeding too hard and too long on her own exquisite beauty. She could smile in the rearview mirror of her car and see the alabaster beam reflected back from her picture in advertisements for Malveaux’s Magic Hair Pomade plastered on every billboard and in the windows of every drugstore starting from West 53rd Street, going all the way up Manhattan and through Harlem for the next hundred blocks. Even now she gazed happily into her vanity as her maid, Justice, applied the French pomade and arranged the dark folds of her hair into thick Victory curls perfectly framing her face. She never used the concoction her mother had created and made famous. Tired of having it smeared on her head since childhood, Mae had thrown away her own grease-filled powder blue tin in the days after her mother’s death. She held out her wrists and Justice dabbed on fragrant dots from the crystal bottle of Caron Fleurs de Rocaille perfume. Mae’s cold-creamed skin glowed bright and her eyes danced with the sparkle of a girl, making her seem younger than her thirty-three years. She knew this feature made her irresistible. Mysteriously, each man thought he had discovered this light for himself and believed only he could see it in her. They never noticed her well-hidden contempt for their arrogance. Mae was vigilant about her expressions. She learned long ago the faces she wore would always be more essential than any dress she put on, no matter if it were a Christian Dior or a Pierre Balmain. Her beauty was a formidable instrument because people liked to stare at her as they would a motion picture actress and, in the same vein, she could tell them any story she chose to project and they would believe it. So she practiced the lift of her cheeks, the turnings of her mouth, the shapes of her lips, and the conjured emotions that she flitted across her eyes. Her masterstroke came when she could wipe her face smooth and present a look of calm so luminous it bewitched her admirers into claiming her a goddess. In rare instances, though, she suffered a rebellion to her visage of serenity. It was an errant twitch seated in the muscles of her lower-left eyelid. She always felt it right before it surfaced. It was as though the weight of all the folly the eye had beheld was suddenly too much for it. She saw how, though small and fast, it unmasked her disdain. Not everyone would notice, but someone less foolhardy—someone like Val Jackson—would never miss such a telling detail. Regina, her white Polish maid, brought in Mae’s long, satin Dior that had arrived from Paris the previous day. Mae stood, stepped into the gown, and enjoyed the feel of the gold fabric flowing down her body in a shimmering cascade. She replaced one hand on Justice’s shoulder and lifted her right foot with the grace of a ballerina. Regina took hold of Mae’s ankle, guided her into leather sling back pumps,then pulled the strap through the buckle. “Ouch!” Mae lit out with her right hand, landing a blow upon the woman’s earand side of her face. Regina’s arm rose in defense. Mae looked away while she finished. The stacked heel added nearly two inches to her height so she had to sit again. This allowed Justice to fasten the necklace of marquise-cut diamonds while Regina clasped the diamond-and-platinum bracelet around Mae’s thin wrist. Mae occupied the largest brownstone on Sugar Hill. Designed by the noted architect Branford Waite, it featured a double width façade and a broad stoop from the front door to the street. Perfect white shades on the windows muted thesun’s glare during the day but let in plenty of light. The flower boxes on the ledges contained enough nicotiana, tuberose, and alyssum so their combined sweet fragrance would greet Mae each time she walked out the door. That night she came gliding out of the building like a new moon rising. All down the block she knew quick hands snapped shutters closed than reopened them a crack so their owners could spy on her floating down the steps to where her man,Lawrence, held open the door to her forest-green Packard. She knew this because she knew exactly how her world was situated—how every single person thought,including and especially what they thought of her. She choreographed each step,each motion, and she moved through Harlem exactly as she pleased because of it. What good was money otherwise? She laughed at the predictability of society and how no one but her seemed to understand how to wield this delicious power. And since her mother died, and then her own husband, Mae reveled in the added sweet freedom of answering to no one. She settled into the caramel cushions of the car’s backseat. Lawrence steered in the direction of the Swan, her chosen nightclub. Mae knew in particular how it would be there. Lately the bandleader would make sure they didn’t play Duke Ellington’s gorgeous new piece, “Lady of the Lavender Mist,” her favorite, unless she was in the room and ready to dance. Her usual party would be seated and waiting at her table. The air already hummed with the expectancy of an unseasonably warm Saturday night. The scene was set. It only needed her to make it come alive. Before Val Jackson had left for the Swan he’d sat in his office above his own club,the Diamond. The handsome walnut clock on the wall struck the half hour: nine thirty. He felt the bass throbbing in the floorboards under his feet. Half of Harlem danced beneath his good graces tonight but Val, pulling on his crisp white tuxedo shirt, thought only of Elizabeth Townsend, who was quietly situated at his aunt Rose’s Westchester estate. She would be getting ready for bed about now. His aunt always insisted on dinner at six—ridiculously early. Then she and Elizabeth would walk in the rose garden. Auntie turned in well before nine and that’s when Elizabeth wandered the great house alone, sometimes reading in the library. Her husband called each night at nine, an annoying detail. Then she would dress in her night-clothes, a thin cotton gown sleeveless, the maid Annie had said and sit on the balcony outside her room and gaze up into the sky before going to bed. One night the housekeeper thought she heard Elizabeth praying out there. Val fastened the silver cuff links at his wrists and recited Elizabeth’s routine to himself twice more as he finished dressing. He knew all the details, thanks to his man Sebastian’s unfailing ability to bribe just the right people in his aunt’s household. Elizabeth would be in bed by ten p.m. sharp; that’s what the latest report had said. He loved the potential of those two succulent hours between eight and ten. Just now, in May, they would be filled with air so thick with humidity no one’s mind would want the trouble of thinking straight. The end of a hot summer day was when a woman’s guard might be down just enough to entertain latent thoughts. But that’s what he enjoyed about this particular conquest. Elizabeth Townsend didn’t have any latent, smoldering desires. He had watched her long enough to know this, seen her loving eyes trained on her straight-as-a-board husband and her arm looped through his. Val would change that. He knew he would be the one to light the match, and whatever thoughts burned in her from their would be entirely his own creation. For a few sweet moments he paused and allowed himself the pleasure of imagining Elizabeth in her bed, her bare skin sliding between the cotton of her nightgown and the famously soft sheets his aunt’s home was known for. The prospect made him ache with satisfaction. A long, slow smile ignited from one corner of his mouth and spread to the other as he sat down behind his desk and leaned back in the enormous burgundy leather chair. Was this what Satchel Paige felt like, coming to the mound to meet afresh opponent after so many years? Was he rolling in the life of it, so excited that there was still someone worth pursuing even after he had bedded and tasted the best? Elizabeth Townsend was so damn perfect not one of these pants down, legs up women easily charmed by his name alone. He would savor Elizabeth Towns end when the time came and it would be so fine the streets of Harlem would want to open up and swallow him, engulfing him in praise and awe. The butler answered so fast it was as though he’d come at Val’s very thought.Without a word, he took his employer’s left hand and, with a silver file, smoothed the nails and cleaned underneath them. “Any news?” Val used his right hand to remove a Montecristo cigar from the mahogany humidor on his desk. Sebastian pulled a lighter from his pocket and lit it. The smoke encircled Val’s head like a gentle fog and the spicy wood aroma filled the office as Val settled into his feel-good body for the night. Val drew on the cigar with a long, deep breath. Nice. He and his wayward love would play their game tonight. There was nothing better than when he and Mae gotto perform before an audience. Only one question remained—who would be their targets? Sophfronia Scott hails from Lorain, Ohio. She was a writer and editor at Timeand People magazines before publishing her first novel All I Need to Get By. Her short stories and essays have appeared in O, The Oprah Magazine, NewYorkTimes.com, Killens Review of Arts & Letters, Ruminate magazine, Saranac Review, Numéro Cinq, Barnstorm Literary Journal, and Sleet magazine. She lives in Sandy Hook, Connecticut, with her husband and son. This entry was posted in Exclusives, Spotlight and tagged Exclusive, Exclusive Excerpt, Harper Collins, Sophfronia Scott, Spotlight.